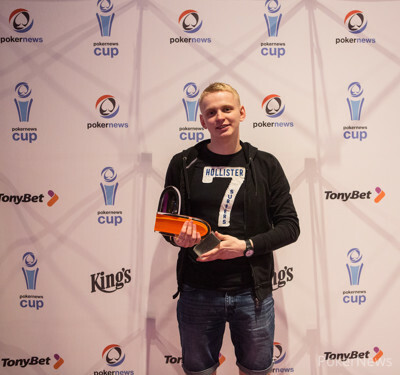 It took Vladzislau Hladkovski a little under eight hours to take down the €230 TonyBet Open-Faced Chinese Progressive Pineapple tournament after a deal for €1,890. Hladkovski recovered from being the first casualty of the day to take full advantage of his second bullet to claim the title, prize money and TonyBet trophy. There were a solid half a dozen players at the start of play, with faces from the various Day 1s of the PokerNews Cup present in the field including eMKey and Paulina Rimkute, but it took until the third level of the day until we saw any one player make some advances well above starting stack. By Level 4 we had already had a couple of eliminations, including the aforementioned Hladkovski, Lars Hellmuth chiKKita banAAna and eventual third-place finisher Andrei Ilin. There was strong play throughout the day, but the hand-of-the-day has to go to Sergii Kyslyi, who returned from Fantasy Land with a grin from ear to ear as he showed Royal Flush-Full House-Aces to soar into the chiplead and eliminate both Paulina Rimkute and Anja Haberger. 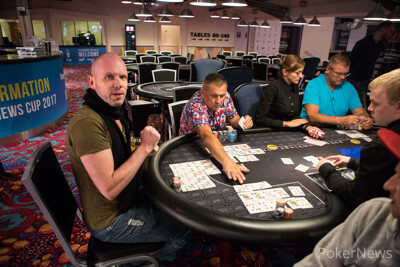 Late registrants Sebastian Langrock and Martin Kabrhel joined the field, with both players firing two bullets, but only Langrock securing a spot in the final six. Langrock would go on to bust in fourth place leaving Vladzislau Hladkovski, Andrei Ilin, Alexander Dovzhenko and Sergii Kyslyi to battle it out. Kyslyi was the shortest of the four of them, but there was to be no fairytale comeback. In his pursuit of Kings up top he fouled to leave the other three to play on. But there was no play. 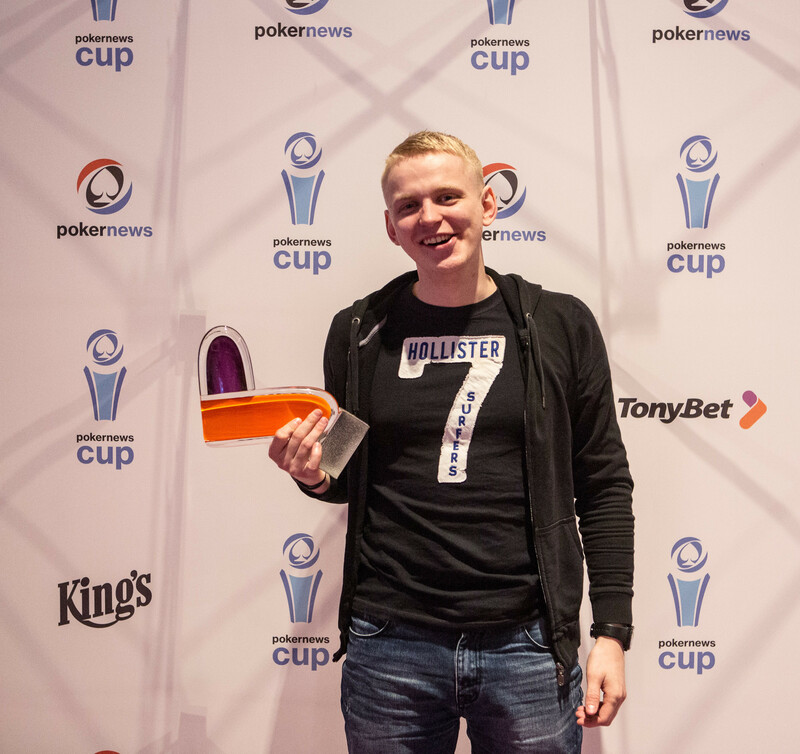 The final three players agreed a three-way deal with chipleader Vladzislau Hladkovski taking the title and trophy by virtue of being the chipleader when the deal was struck. Meanwhile, the PokerNews Cup is down to its final eight players, who will resume tomorrow to play down to a winner. Stay tuned to PokerNews for all the action from the final table. Stay tuned for a full recap of all today's action! The three remaining players; a Belarussian, Russian and Ukrainian have paused the clock to facilitate a deal discussion to take place. 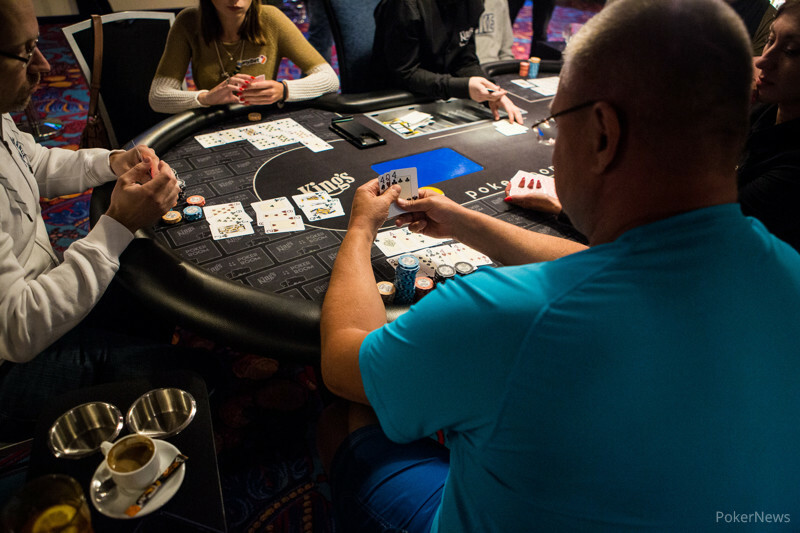 Heads-up against Vladzislau Hladkovski, Sergii Kyslyi fouled his hand and handed over the rest of his chips to Hladkovski to burst the bubble. With the elimination of Sebastian Langrock players are now playing hand-for-hand on the exact money bubble. Sebastian Longrock was astounded as both of his opponents hit their perfect cards to avoid fouling and he had to hand over a hefty chunk of chips to Andrei Ilin, while receiving a paltry amount in comparison from Alexander Dovzhenko. The prizepool has just been confirmed with only three of the 26 players who registered for this event receiving money. With five left it looks likely that there may be some deal talk in the nto too distant future. Both Sergii Kyslyi and Petteri Voutilainen bust which meant that Voutilainen was eliminated and Kyslyi took 30Pts worth of damage to his stack which means Hladkovski now joins him in vying for the tournament chiplead.